Are you looking for the best English schools in Rampura, District Neemuch? 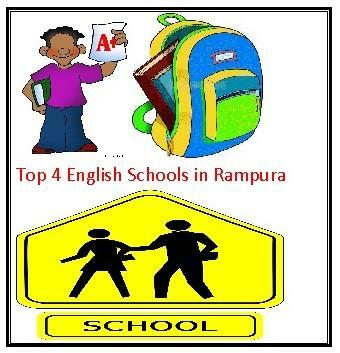 This article provides the detailed information about top four English schools in Rampura. Please read the article before selecting a good English school in Rampura. English is the universal language and all parents want to admit their kids in a good English school. An English school provides good infrastructure and follows rules & regulations of concern boards more strictly. They provide good salary to the teachers and provide all the facilities to the students. You can find the good campus for learning, well-furnished library, well-equipped laboratories, language laboratories, transport facilities, etc. in an English school. Most of the English schools provide education from Nursery to higher secondary level. So it is necessary to seek admission in a good English school for better future. There are many benefits of taking admission in a good and reputed English school. Its a fact that the English schools try for the whole development of the students. Different curriculum activities, project works, educational tours, etc. enhance the learning capacity of students. All these activities provide different experience to the students and help in their development. English school provides modern methods and technologies to the students. CCE pattern is adopted by the English schools. The English schools take care of students in a better way and try to develop different skill in the students. Mohammediya Higher secondary school is one of the best English school of Rampura which provides education in English medium. The school imparts education from Nursery to higher secondary level. The main streams of higher secondary level are Science Mathematics, Science Biology and Commerce. The school was established in the year 1910. This is also known as Bohra school as Moahmmediya school is run by Bohra community. The school is recognized by Madhya Pradesh Board of Secondary Education, Bhopal. The school maintain 100 per cent result in the board classes every year. The admission procedure is easy but there is some shortage of seats. The maximum seats in every class is 25. So if you are seeking admission for your kids in Mohammediya Higher Secondary school, Rampura, you have to contact the principal of the school as early as possible. Alpha high school is the oldest English school in Rampura that was started in the year 1987. Now at present time Alpha High School, Rampura imparts coeducation in both Hindi and English medium. The school provides transport facilities for the students of Rampura as well as nearby villages. You can seek admission by visiting the office of principal at the school time. The admission starts in the month of May every year. The main specification of the school is co-curriculum activities, educational tour, fun fair on children day etc. The school is also affiliated with Madhyamik Shiksha Mandal Madhya Pradesh, Bhopal. Vedika High School Rampura was established by Mr Harivallabh Mehta in the year 1999. This school is known for discipline in the students, education tour, programs on Independence Day and Republic day, co-curriculum activities, etc. Also they have 3 buses for bringing children from every corner of Rampura Tehsil. You can contact the principal of the school at any time for the query related to admission. Generally, the admission starts in the month of April every year. Vedika High School, Rampura may be the best choice if you want a good education at low cost. Madam Query High school is one of the best English school of Rampura Tehsil. Madam Query High School, Rampura is also known as Neil's Academy, Rampura. The school provides the entire basic infrastructure to the students. Well trained teachers, good campus for learning, transport facilities, educational tour, free computer education etc. are the main assets of the school. The school timing is 8 AM to 1 PM. The school arrange remedial classes for the students after the month of December every year. Also this institution organizes teacher training camps for the teachers in the month of May and June every year. If you want to seek admission in the above schools, please contact the principal of the school along with the Birth certificate, Adhaar card, Transfer certificate, Ration Card, income certificate ( if applicable), caste certificate (if applicable), two passport size colored photos and Bank account number. You can email the school if you have any query. The 25% seats are reserved under the RTE Act of 2009 for the students of SC, ST, OBC and BPL in the above-mentioned schools.